At a measly 5-inches, nobody could criticize the original Zebra F-301 for being a large pen. But in case you find yourself in a situation where every inch counts, Zebra has produced the F-301 Compact, a version measuring only 3.75 inches. The Compact retains the original aesthetic of stainless steel and hard, black plastic, but it otherwise feels like a much different pen. To achieve this extra-small size, Zebra has created a rather clever design which uses the standard 0.7mm F-301 ballpoint refills, but replaces the original retracting mechanism with a cap. When the cap is on, the pen can be stowed in its 3.75-inch form, but when the cap is posted to the end of the pen, it creates a 5-inch writing instrument. 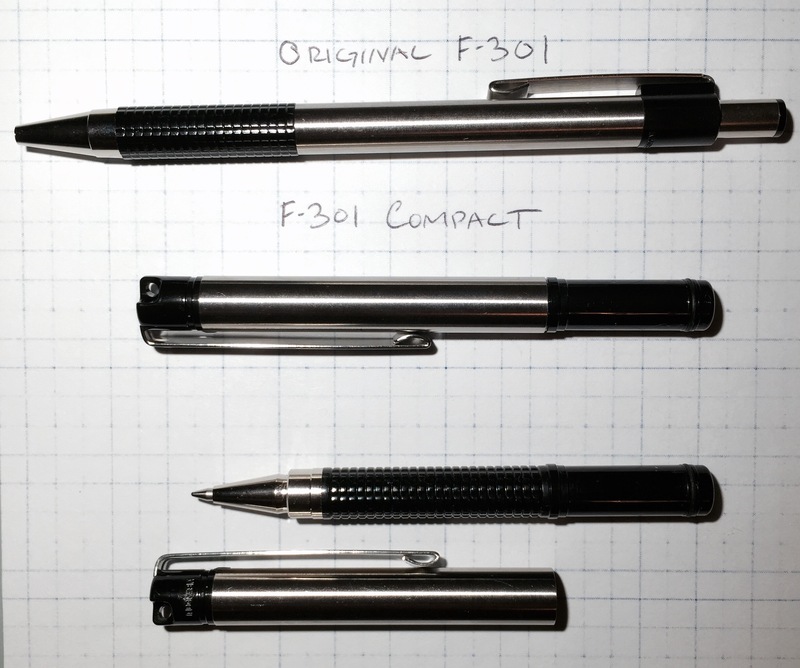 It’s certainly a small, durable design, but it’s unfortunately much more uncomfortable to write with – and comfort wasn’t the F-301’s strong suit to begin with. Really, don’t plan on using the F-301 Compact for anything more than jotting down a few notes here and there. The cap posts to the end of the pen loosely, so it tends to twist and slide while writing, and though the extra-large clip is very sturdy, it really just gets in the way. If, on the other hand, you decide to write with the cap off to the side, you’ll find that the pen is too small and unbalanced. Such a small pen is a neat idea, and I’m sure there are some situations where it might be useful. Most of the time, however, it isn’t worth using such an uncomfortable pen. Instead, either stick with the original F-301 or try a Tombow Airpress for a much more comfortable writing experience. YouTube user Eric Dunlap has a short video showing off the F-301 Compact. Not Enough Bits has a short review. The clip broke off his pen after 7 months, which isn’t a bad lifespan considering its a pretty inexpensive pen. 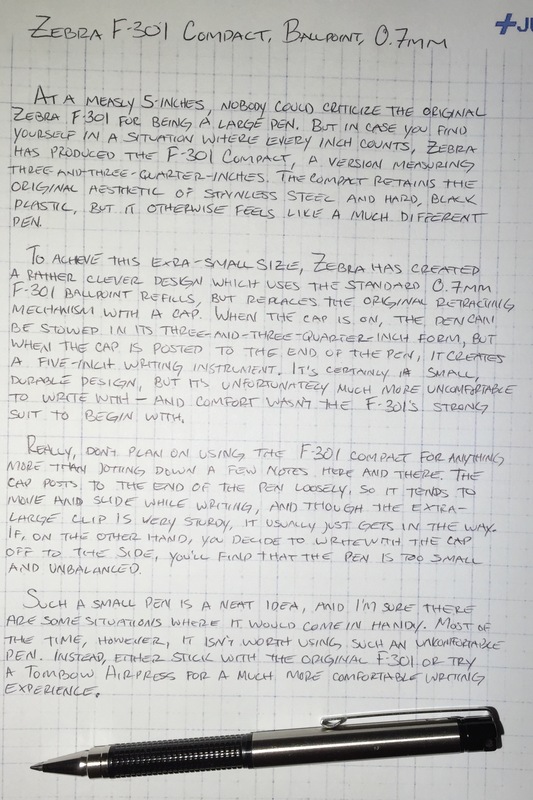 A thread on EDCForums.com, started by user bruner, has a thread about the F-301 Compact with lots of pictures.